The third Saturday of October 1976 was a magical day in the history of Thoroughbred racing. People of all ages would become lifelong fans of the real-life "Black Stallion" after catching their first glimpse of him on this picturesque afternoon at beautiful Belmont Park. Seattle Slew's first two races had been weekday affairs that only a privileged few were able to see, but the prestigious Champagne Stakes, contested on October 16, would be a nationally televised event. Many fans that saw the telecast this day witnessed the total package of what a Thoroughbred is meant to be. Slew's incomparable amber eye and amazing speed could captivate any onlooker. So too, could his burning determination and iron will to win. A physically intimidating colt, Seattle Slew had an air of superiority in his attitude and an extreme mental confidence that trainer Billy Turner said "set him apart from all others." These traits enamored the many fans that would become devoted followers of Seattle Slew and his offspring well into the 21st Century. A particularly eye-catching characteristic of Seattle Slew was his pre-race routine that owner Karen Taylor describes as "Slew's War Dance." It caught the author's attention immediately this day and was an awesome sight to behold. As soon as jockey Jean Cruguet was up, Slew danced and pranced sideways, all keyed-up, with the sweat from his eagerness turning his coat nearly jet-black. Amazingly, Slew continued this routine through the post parade and to the starting gate. While most horses were moving in a straight line during the pre-race warm-up routines, Seattle Slew was prancing completely sideways, his attention focused on the lead pony's neck. The aura emitted by Slew this day made a lifelong, lasting impression. This was a very unique horse, with so much charisma that it was contagious to those around him and magnetic to fans of the sport. The day before the race, Seattle Slew displayed his fitness by blowing out three-furlongs in: 34 1/5 under an extremely restraining hold by exercise rider Mike Kennedy. The competition Seattle Slew would have to face in this Grade I event was stellar. For the Moment was already a Grade I winner and million-dollar colt, a half-interest in him having recently been sold for $500,000. Since winning the Futurity, he had added a division of the Cowdin Stakes to his string of four straight victories. Turn of Coin, a son of Best Turn, had won the Tremont and Sanford Stakes, and had finished second in the Saratoga Special and Hopeful Stakes. Ali Oop had triumphed in the Sapling Stakes and finished second in a division of the Cowdin. Sail to Rome was the victor of the first division of the Cowdin Stakes. Cruise On In had faced Slew last time out and put forth a very solid and game effort in finishing second. Turner was not as concerned about the opposition as he was about the number 3 post position. Knowing Slew's tendency to break slowly from the gate, Turner was afraid that if he got trapped along the rail, he might run over the top of other horses. Turner's fears were unfounded as Seattle Slew broke alertly from the gate. Cruise On In assumed a very brief lead on the outside, but Slew soon took over. He ran freely on the lead with his beautiful mane blowing in the wind, evoking images of a wild stallion leading his pack of subordinates. He set fractions of :23 2/5 for a quarter-mile, :46 for a half-mile, and 1:10 for three-quarters of a mile. For the Moment had been tracking Slew in second position and tried hard to narrow the gap when jockey Eddie Maple put him into a drive. When he got within two lengths of Slew, Cruguet tapped his mount a few times and received a burst of acceleration he had never felt before. He hand-rode Slew home, actually easing him up near the finish, for a 9 and ¾ length victory over For the Moment. Sail to Rome closed to take the show position. The Daily Racing Form chart writer called it "an easy score." Seattle Slew's final time was 1:34 2/5. It was the fastest mile ever run by a two-year-old. Seattle Slew had produced a performance for the ages. It was a remarkable achievement, especially considering that the colt could've gone considerably faster if he'd been pressed earlier or more urgently, or asked by Cruguet. Several important people joined the celebration in the winner's circle. Mr. and Mrs. Ben Castleman of Lexington, Kentucky, the breeders of Seattle Slew, were there to enjoy the moment and attend the victory celebration afterwards. Mrs. Douglas MacArthur, widow of one of the greatest military leaders in American history, presented the Champagne Stakes trophy to the winning team. "The only threat to the undefeated colt came at the quarter pole, when (jockey) Eddie Maple put For the Moment into a drive. But all (trainer LeRoy) Jolley's horse could do at that point was to narrow the leader's margin before Jean Cruguet asked his colt for something extra for the first time in his career. Cruguet hit the colt one hard shot, right-handed, and the message was transmitted instantaneously. He increased a length-and-a-half lead to three lengths within a sixteenth of a mile and tripled that margin at the finish. Cruguet just sat back and enjoyed the ride. The only activity, aside from the marvelous running action of this exciting thoroughbred, was the ear-waving exercise performed by the winner inside the final furlong ... all of racing figures to gain when an exceptional horse like this comes along. He's what the game is all about." "Seattle Slew was favored over a fine field of more seasoned two-year-olds in the Champagne. He was well cast as the favorite, easily beating back the challenge of Futurity (gr. I) winner For the Moment. He drew away handily to win by almost 10 lengths in record time for the 109-year-old race. The key moment in the one-mile Champagne came as the field neared the head of the stretch. 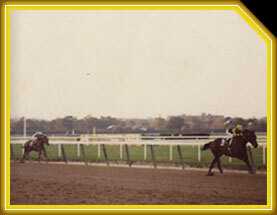 Seattle Slew's three-length margin over For the Moment began to shorten. For the Moment steadily drew closer, getting within a little more than a length of the leader. Here was the moment when a nice, speedy, but still untested colt might well have been expected to be caught by a more experienced rival. "Seattle Slew's response to his first challenge was remarkable. With jockey Jean Cruguet only flicking him with the whip, he began to pull away rapidly from For the Moment, which was under the whip from Eddie Maple. It was no contest down the stretch, as Seattle Slew opened 9 and ¾ lengths, going under the wire in 1:34 2/5, a time that nipped one-fifth of a second from Vitriolic's Champagne record." The publications were impressed and so were the Eclipse Award voters. At year-end they presented Seattle Slew with the 1976 Eclipse Award for the nation's best juvenile colt. Run Dusty Run and Royal Ski each had won 6 times in 9 races. Their connections were upset with the voting, thinking that their colts had done more to warrant the award. But they simply were caught up in the moment of trying to compete against a legend. And they weren't seeing then what is clearly evident in retrospect today - in one blazing twenty-six day span, Seattle Slew had brought off a tour de force unmatched in American racing history. In addition to being named America's champion two-year-old colt and new Derby favorite, Seattle Slew was high weighted at 126 pounds on the Experimental Free Handicap. He was weighted in a more practical manner by veterinarian Dr. Manuel Gilman at 1,120 pounds at the conclusion of his juvenile season. Gilman also measured the 15 hand 3 3/4-inch colt at his girth and found him a half-inch larger than Secretariat's 74 inches at the same time in his career. On August 29, 2003, the Taylors spoke about their feelings after Seattle Slew's stunning performance in the Champagne Stakes. "When we got into the sport our highest hope was to win the Champagne," Karen Taylor said. "Slew's performance was a dream come-true. Before the race I knew we had something great, but I was concerned because all his starts were very close together. Even when you have a once-in-a-lifetime colt, things can still go wrong. I was just hoping for good luck so he could show his ability. "Afterward, some horsemen that I respected very much told me they 'had never seen anything like him ... except maybe Ruffian.' I think he proved he was very special." For Mickey Taylor, it was the moment when he realized he was in the presence of greatness. "It changed my life," he explained. "Seattle Slew was like a son to us. I knew that I had to get trustworthy people to help take care of him.